Innovations in plumbing products have increased, particularly over the past decade and while they’re helping make our lives better, it’s important that they are being used and installed correctly. 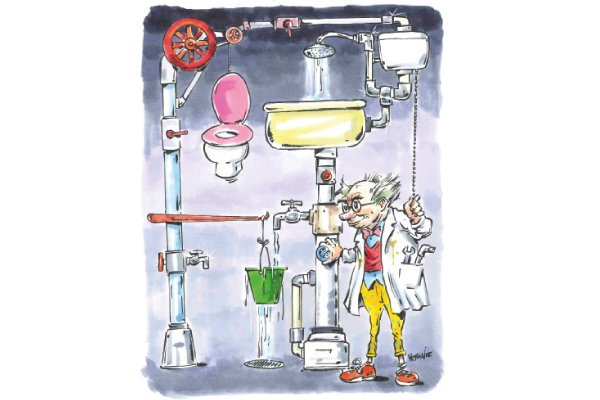 PROVE Standards and Engineering plumbing test consultant Terry Nguyen explains. The development of plumbing products has stepped up its game, particularly over the last decade or two. The traditional systems we have always relied on still form the backbone of our network for delivery of potable water and removal of waste, however the manner in which we use and rely on this the framework is seeing changes as technology advances. New products are a welcome introduction into our lives and exist generally to help make life better. Whether it’s an appliance able to perform automated tasks or innovative products that allow quicker and easier plumbing connections, innovative products are here for our benefit. These products have a place in our lives but do not often have a place within the current Australian Standards that are used to provide WaterMark certification. All products connected to the water supply and drainage network must undergo a risk assessment, where the outcome determines whether a product must carry a WaterMark certificate. If a WaterMark certificate is needed, the product is required to be assessed against the relevant standard or specification to ensure that the product is able to meet minimum design and performance requirements. However, many of the new products being developed do not fit within the scope of current Australian Standards or technical specifications. The journey for these products therefore begins with the development of a new technical specification that will be used to assess the product. New technical specifications are developed with the help of a WaterMark Conformity Assessment Body (WMCAB) under the guidance and rules set out by the Australian Building Codes Board (ABCB). The ABCB uses industry technical experts to offer advice where possible to ensure the specification being developed is correct and captures any necessary prescriptive design and performance requirements. The process can sometimes be quite long depending on the complexity of the product and the risks it poses to plumbing networks. However, the end result is that an innovative product can be tested assessed and bear the necessary WaterMark certificate needed for a compliant installation. It allows a path for new and innovative products to be brought to market for use in plumbing and drainage networks. It also allows for a passage to WaterMark for products that have existed for a period of time now but have often been over-looked through the WaterMark scheme. This list grows each day as technology brings new innovative products to the market. It is important that any products installed into plumbing and drainage networks are always checked for their need of WaterMark certification. Yet not all products need the mandatory certification. When uncertain, it is always best to check the ABCB’s website to determine if a product exists on the WaterMark Schedule of Products and/or the WaterMark Schedule of excluded products. As a general rule, if a product is connected to potable water or drainage networks it is likely to require WaterMark certification. While a product might initially seem to be a great inclusion into our daily lives, care should be taken to ensure that it is able to be used and is used correctly installed under the limitations of the product’s certification.